A 4 link provides control of the axle during suspension cycling and to locate the axle under the vehicle. The most common 4 link is used with panhard bar. This is found in many cars and pickup trucks. The 4 link for a solid axle has a few variations such as the triangulated 4 link and the Parallel 4 link. Typically each arm has a spherical joint or rubber bushing at each end. Consequently they react to loads along their own length, in tension and compression, but not in bending. In a solid axle suspension the upper arms may have an angle of at least 45 degrees between them, to prevent the axle from moving from side to side while allowing the axle to articulate and move freely up and down. In a solid axle the lower arms control forward and backward motion, the upper arms control forward and backward rotation. This rotation is present under acceleration and braking. 1928-1931 Model A Rear Coil-Over Upper Mounts. 1932 Ford Rear Triangulated 4-Link kit (includes bars and brackets). Triangulated 4-Link Kits are very popular as they do not require a Panhard Rod. This design is also similar to many GM installations. Bars are fully adjustable, 1"x.156 tube with 3/4" stainless adjusters and urethane bushings, angled and straight chassis brackets, multi-position coil-over axle brackets, tabs and hardware. Must use RB-052 '32-40 Ford Crossmember and HK-049 coil over hardware kit. 1932 Ford Rear Polished Stainless Steel Triangulated 4-Link kit (includes bars and brackets). Triangulated 4-Link Kits are very popular as they do not require a Panhard Rod. This design is also similar to many GM installations. Bars are fully adjustable, 1"x.156 tube with 3/4" stainless adjusters and urethane bushings, angled and straight chassis brackets, multi-position coil-over axle brackets, tabs and hardware. 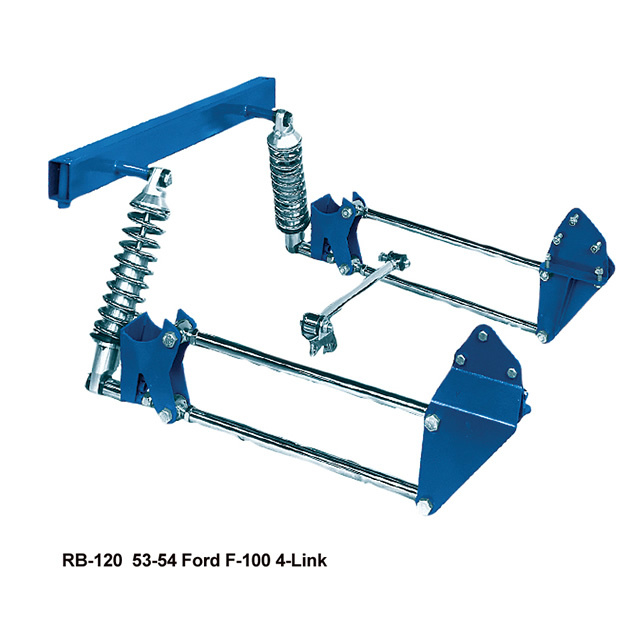 Must use RB-052 '32-40 Ford crossmember and HK-049 coil over hardware kit. 1932-1934 Ford Rear Parallel 4-Link kit (includes bars and brackets). The Parallel 4-Link Kit is very easy to install and is a good choice for many installations. It uses 1"x.156 tube bars with 3/4" stainless adjusters and urethane bushings, chassis mounting brackets, multi-position coil-over axle brackets and hardware. These kits require the use of a Panhard Rod and are intended for fully boxed or aftermarket frames. 1932-1934 Ford Rear Stainless Steel Parallel 4-Link kit (includes bars and brackets). The Parallel 4-Link Kit is very easy to install and is a good choice for many installations. 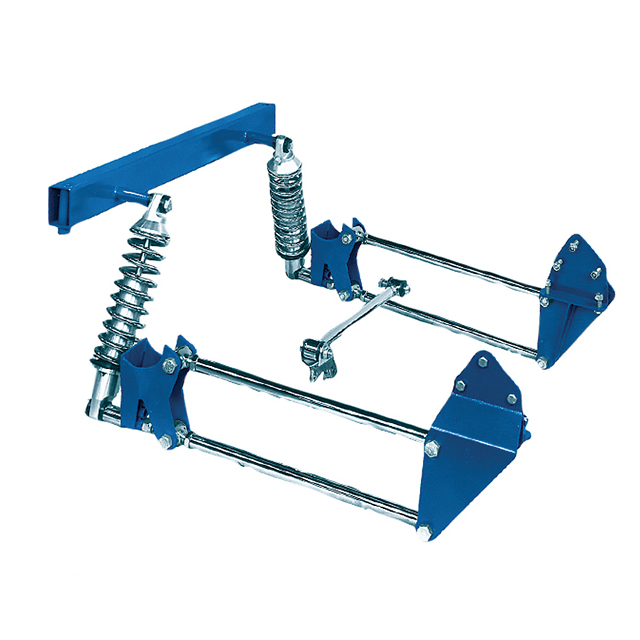 It uses 1"x.156 tube bars with 3/4" stainless adjusters and urethane bushings, chassis mounting brackets, multi-position coil-over axle brackets and hardware. These kits require the use of a Panhard Rod and are intended for fully boxed or aftermarket frames. 1933-1934 Ford Rear Triangulated 4-Link kit (includes bars and brackets). Triangulated 4-Link Kits are very popular as they do not require a Panhard Rod. This design is also similar to many GM installations. Bars are fully adjustable, 1"x.156 tube with 3/4" stainless adjusters and urethane bushings, angled and straight chassis brackets, multi-position coil-over axle brackets, tabs and hardware. 1933-1934 Ford Rear Stainless Steel Triangulated 4-Link kit (includes bars and brackets). 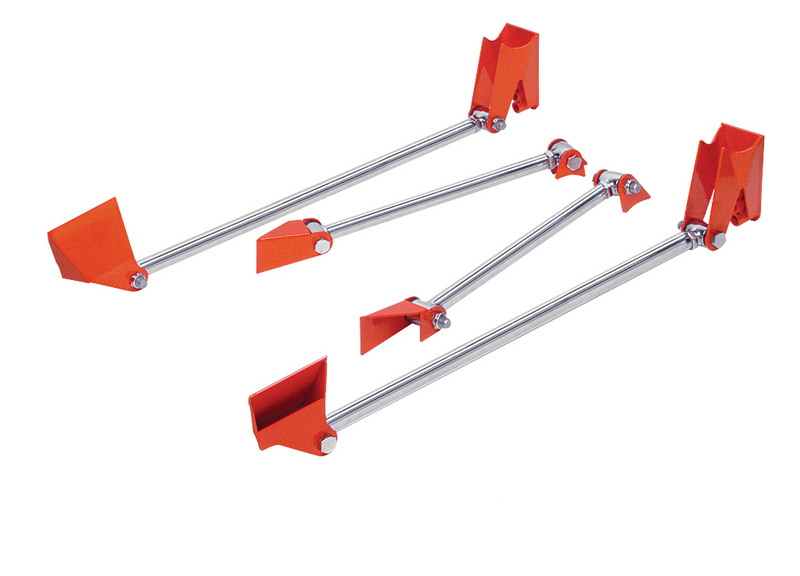 Triangulated 4-Link Kits are very popular as they do not require a Panhard Rod. This design is also similar to many GM installations. Bars are fully adjustable, 1"x.156 tube with 3/4" stainless adjusters and urethane bushings, angled and straight chassis brackets, multi-position coil-over axle brackets, tabs and hardware. 1947-1953 Chevy Pick-Up Stainless Steel Rear 4-Link, (includes bars, brackets, coilover crossmember). Coil-over 4-Link rear suspension provides the best ride for any classic truck. These kits attach directly to the stock frame rails. The adjustable axle brackets let you set ride height in one of three positions, and a bolt-in upper crossmember for coilovers is included. 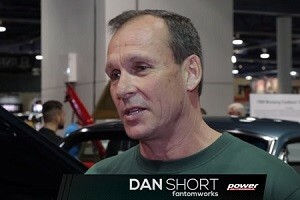 Works with Heidts CO-101 and CB-105 coilover shocks. 1953-1954 Ford F-100 Rear 4-Link, (includes bars, brackets, coil-over crossmember). Coil-over 4-Link rear suspension provides the best ride for any classic truck. These kits attach directly to the stock frame rails. The adjustable axle brackets let you set ride height in one of three positions, and a bolt-in upper crossmember for coil-overs is included. Works with Heidts CO-101 and CB-105 coilover shocks. 1953-1954 Ford F-100 Polished Stainless Steel Rear 4-Link, ( includes bars, brackets, coilover crossmember). Coil-over 4-Link rear suspension provides the best ride for any classic truck. These kits attach directly to the stock frame rails. The adjustable axle brackets let you set ride height in one of three positions, and a bolt-in upper crossmember for coil-overs is included. Works with Heidts CO-101 and CB-105 coilover shocks. 1955-1956 Ford F-100 Rear 4-Link, (includes bars, brackets, coilover crossmember). Coil-over 4-Link rear suspension provides the best ride for any classic truck. These kits attach directly to the stock frame rails. The adjustable axle brackets let you set ride height in one of three positions, and a bolt-in upper crossmember for coilovers is included. Works with Heidts CO-101 and CB-105 coilover shocks. 1955-1956 Ford F-100 Polished Stainless Steel Rear 4-Link, (includes bars, brackets, coilover crossmember). Coilover 4-Link rear suspension provides the best ride for any classic truck. These kits attach directly to the stock frame rails. The adjustable axle brackets let you set ride height in one of three positions and a bolt-in upper crossmember for coilovers is included. Works with Heidts CO-101 and CB-105 coilover shocks. 1955-1959 Chevy Truck Stainless Steel Rear 4-Link, (includes bars, brackets, coil-over crossmember). Coil-over 4-Link rear suspension provides the best ride for any classic truck. These kits attach directly to the stock frame rails. The adjustable axle brackets let you set ride height in one of three positions, and a bolt-in upper crossmember for coil-overs is included. Works with Heidts CO-101 and CB-105 coilover shocks. 1928-1931 Model 'A' Rear Parallel 4-Link kit (includes bars and brackets). The Parallel 4-Link Kit is very easy to install and is a good choice for many installations. 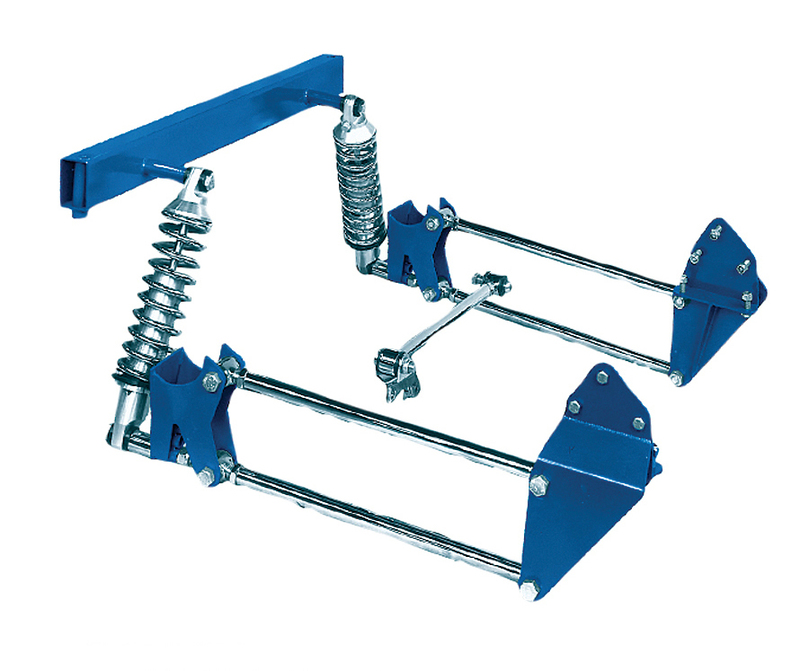 It uses 1"x.156 tube bars with 3/4" stainless adjusters and urethane bushings, chassis mounting brackets, multi-position coil-over axle brackets and hardware. These kits require the use of a Panhard Rod and are intended for fully boxed or aftermarket frames. 1929-1931 Model 'A' Rear Triangulated 4-Link kit (includes bars and brackets). 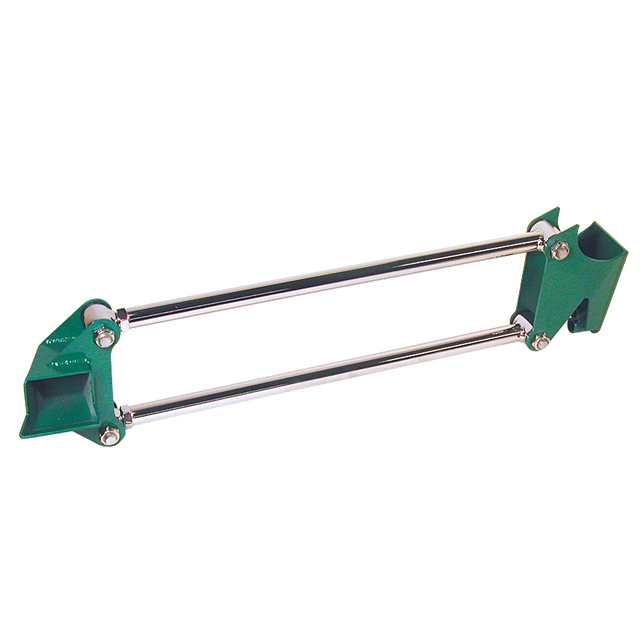 Triangulated 4-Link Kits are very popular as they do not require a Panhard Rod. This design is also similar to many GM installations. Bars are fully adjustable, 1"x.156 tube with 3/4" stainless adjusters and urethane bushings, angled and straight chassis brackets, multi-position coil-over axle brackets, tabs and hardware. 1928-1931 Model 'A' Rear Stainless Steel Parallel 4-Link kit (includes bars and brackets). The Parallel 4-Link Kit is very easy to install and is a good choice for many installations. It uses 1"x.156 tube bars with 3/4" stainless adjusters and urethane bushings, chassis mounting brackets, multi-position coil-over axle brackets and hardware. These kits require the use of a Panhard Rod and are intended for fully boxed or aftermarket frames. 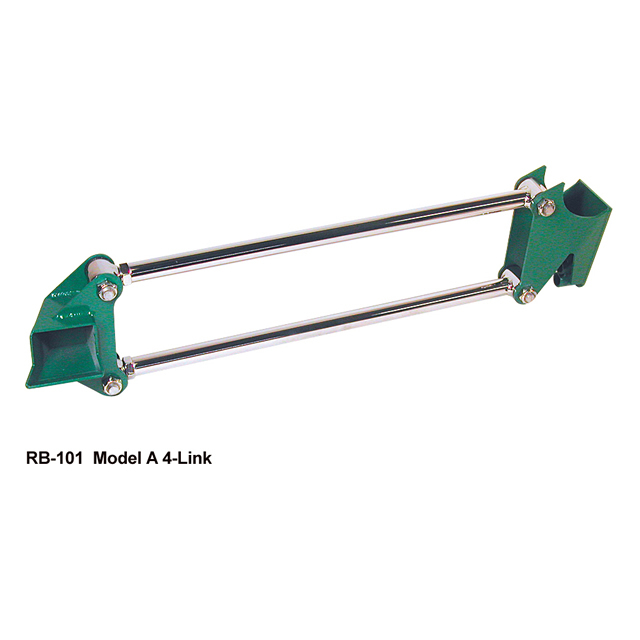 1928-1931 Model 'A' Rear Stainless Steel Triangulated 4-Link kit (includes bars and brackets). Triangulated 4-Link Kits are very popular as they do not require a Panhard Rod. This design is also similar to many GM installations. Bars are fully adjustable, 1"x.156 tube with 3/4" stainless adjusters and urethane bushings, angled and straight chassis brackets, multi-position coil-over axle brackets, tabs and hardware. Universal Rear Triangulated 4-Link kit (includes bars, brackets, coil-over crossmember). 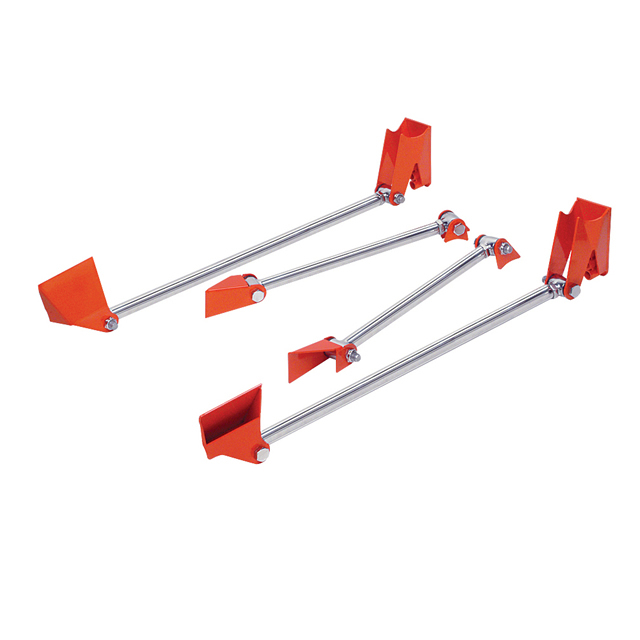 Triangulated 4-Link Kits are very popular as they do not require a Panhard Rod. This design is also similar to many GM installations. Bars are fully adjustable, 1"x.156 tube with 3/4" stainless adjusters and urethane bushings, angled and straight chassis brackets, multi-position coil-over axle brackets, tabs and hardware.